minpair generates a complete list of minimal pairs (words differing in exactly one segment) from a list of words. The input should consist of one entry per line in UTF-8 Unicode. By default, each entry consists of two parts, separated by a tab. The first field is the word. The second field is an identifier. Typically this will be a gloss or record number. The output lists the two segments contrasting in the minimal pair, then the two words, each followed by its identifier, if supplied, and then the context for the difference, with a difference site marker (by default an underscore) marking the site of the difference. The segments differing are listed in a fixed order (that of the character codes) so that all tokens of the same pair will sort together. By default minpair searches only for pairs of words of the same length differing in exactly one segment. Command line options allow the addition of single insertions/deletions and single transpositions. In order to find all minimal pairs it is normally necessary for the input notation to use one character for each segment. Even in IPA transcription, this is often not the case. minpair provides for this situation by accepting definitions of multigraphs. For instance, if you put the sequences p', t', and k', representing glottalized /p/, /t/, and /k/, in the multigraph definition file, minpair will treat them as single segments. The multigraph definition file should consist of the character sequences that are to be treated as single segments, one per line. Like all other input, this file should be encoded in UTF-8 Unicode. Sequences declared as multigraphs are compressed to a single UTF-32 codepoint so that they will compare as single segments, then decompressed on output. The basic program has a command-line interface. 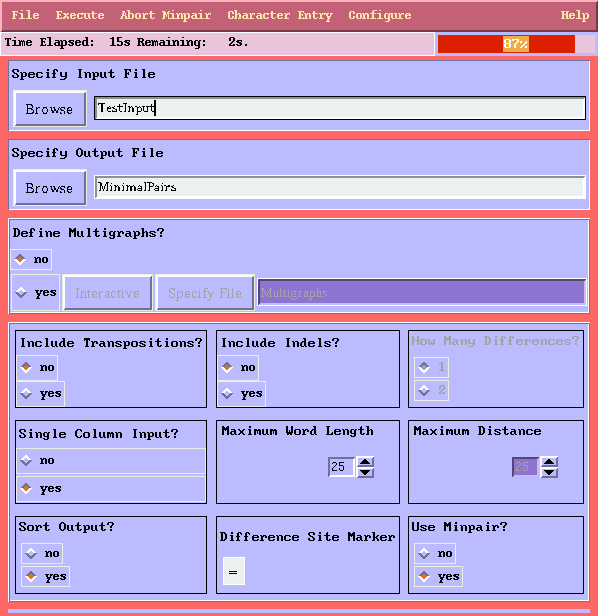 mpg provides an optional graphical interface. mpg will also arrange for the output of minpair to be sorted if a suitable sort utility is available. Standard sort utilities like Unix sort will do, but if the data contains multigraphs, the best results will be obtained using msort since it can read and use the same multigraph definitions as does minpair. It is also possible to use mpg without minpair. mpg can find minimal pairs involving substitutions but currently cannot handle indels and transpositions. mpg is much slower than minpair. On a list of 10,000 words, for example, minpair took 4 seconds while mpg took 321 seconds. The difference is much less significant for shorter word lists. mpg is also able to find pairs of words that differ in two positions, which minpair does not know how to do. This is useful when looking for phonological rules. The maximum distance between the two positions may be specified. minpair should compile and run without difficulty on any POSIX-conformant system. It is known to compile and run without modification under GNU/Linux, FreeBSD, and SunOs. If the internationalization and localization libraries used by minpair are not available, as under Mac OS X, the autoconfiguration system will omit them. mpg should run anywhere that Tcl/Tk is available, including GNU/Linux, FreeBSD, Mac OS X, and Microsoft Windows. However, a few features may not work on non-Unix systems. In particular, the Abort Minpair command depends on the existence of a Unix-style kill program that can be used to send a signal to another process. mpg will run properly under Mac OS X if you have installed X11 and use Tk-X11. (As of Mac OS X 10.4 "Tiger", X11 is an optional install provided on the distribution CD.) mpg now adapts itself to Tk-Aqua sufficiently well as to be usable but necessarily behaves somewhat differently. If you would like to be notified of new releases, subscribe to minpair at Freshmeat. Both minpair and mpg are internationalized using the GNU gettext system. A French message catalog is provided for minpair. Multigraph definition files may now contain more than one multigraph per line, separated by whitespace. This allows msort sort order definition files to be used for their collating sequence definitions. The changes affect only mpg. Fixes a bug arising from the interaction of glosses and multigraphs. Improves handling of glosses in other ways. Eliminates the dependency on the iwidgets package, simplifying installation. File names are now minimized. I/o channels are now explicitly configured for utf-8. GNU autoconfiguration is now available. It is now possible to run mpg without minpair. mpg can find minimal pairs involving substitutions but not indels or transpositions. mpg is slower than minpair but fast enough as to be tolerable for lists of several thousand words. mpg can find pairs of words differing in exactly two positions. This is useful in looking for phonological rules. Improved codepoint validation in popup for entering characters by Unicode codepoint. Now clear message window at the beginning of each attempt to insert a character. Also gave the popup a title. Corrected error in accented letter chart in mpg that had an erroneous value for i with double grave. Updated font control panel to new version that provides color control. Scrollbars now scroll by a large increment if the right mouse button is used in mpg. Added list of Tcl commands available in init file to the help menu of mpg. Added Save Configuration command to mpg. The GUI now sorts the output by default so that all tokens of the same minimal pair will be grouped together. The sort is actually performed by a sort utility run as a child process. msort will be used if it is available since it understands multigraphs. If msort is not available, a utility named sort will be used if available. The GUI has been renamed mpg. MinpairG was too long and funny looking. The GUI has been reorganized and beautified. It is now possible to configure fonts interactively. The balloon help toggle was moved from the Help menu to the newly created Configure menu. Many aspects of the GUI can now be configured by means of an initialization file. These include features of the GUI itself such as fonts and colors and default settings for minpair parameters. It is also possible to define custom character insertion charts in the initialization file. Those familiar with the International Phonetic Alphabet may if they desire reduce the size of the IPA consonant and vowel charts by suppressing either or both of the row and column labels, interactively or via the initialization file. Command line flags were added to report the program version, list the command line flags, prevent the reading of the initialization file, and set the debug flag. Some further adaptations to Tk-Aqua were made. The maximum number of multigraphs permitted was doubled. System identification by the GUI has been improved. The GUI now detects that it is running under Tk-Aqua on Macs and adapts itself. A bug in the GUI was fixed that triggered an error when the vowel chart was deiconified. Instead of just trying to use the default browser, the GUI now works through a list of browsers, trying each in turn until it finds one that is available. A progress bar and abort button were added to the GUI. An optional graphical user interface, MinpairG, has been added. By default the input now consists of two columns per line rather than one, separated by a tab. The second column is intended for an identifier, typically a gloss or item number. A new command line option allows the use of the earlier single-column input. The program has been internationalized. A French translation is now available. The deprecated S and C printf conversion specifications have been replaced. The principal change in version 3.0 is the addition of the ability to compress multigraphs. Output is now written on the standard output (since one almost invariably wants to sort it before using it) and input is now read from standard input unless a file name is specified on the command line. All input and output is now UTF-8 Unicode. DOS support has been dropped. Back to Bill Poser's software page.